Some people have weird hobbies. Video editor Trevor Carmick’s is animating beer labels. The Cartoon Brew’s Chappell Ellison has an article on Carmick and his animated beer labels, including a link to them. Since the labels include anthropomorphic animals, real animals, and fantasy monsters, I am including it here. Besides, I suspect that most Flayrah readers like beer, whether it is anthropomorphic or not. Speaking as a major beer geek, I approve of this! A creative use of After Effects masks and puppet tool? Looks like a lot of fun to work on... I hope he can get some "review samples" of beer out of it. I'd do it for those beers!
" Into the C ship were supposed to the people who made things and did things, and into the B ark would go everyone else, such as hairdressers and telephone sanitizers." " Looks like a lot of fun to work on..." I'm sure his joy was profound. AKA "Is this a news site or some dude's blog"
Well when a "article" just asking a question about gays and three sentences long gets 900 views while our long in-depth reviews can barely break 200 in the same time frame, well I guess you guys want it to be "some dude's blog". Sorry Doug, the market has spoken. People like hair-dressers. In fairness, the post in question was boosted from significant traffic from Reddit and Lulz (NSFW); it's often not so much what people are interested in as what they're pointed at. Discussion-style pieces also get a lot of visits from people returning to see what others have said, and to reply to them. Yeah you guys, vanity publishing about gay foxes in high school should get more attention than international news. If it did, this place would get all the views. But readers want Hot Gay Russian Blogs instead. Why just let writers write about what interests them, when there's views at stake? We get paid for those sweet, sweet views. So let's get to work and gay it up with 3 sentence gay posts. This is serious gay furry business here. Gay. That was just an example really, it was more to note that reviews about furry art, or games receive marginal views compared to anything sociological in any sense. Nothing against the content being about gay furries in Russia, cause it's still about furries. Even my articles, the ones dealing with social or IRL events that are about furry fandom get far more hits than those about furry works. Then again, that gripe might be moot after thinking about it. When people buy the NYT they probably are more likely to read the main stories about what's going on in the world than the arts & entertainment section... (heck they'll probably view the Sports section more often than A&E). Was just kinda in a mood last night really, lack of social interaction over the past month and the first time Flayrah starts with a "religion is the cause of all suffering" debate. I at least learned that secular VS religion conflicts are far worse in Russia than they seem to be in the US, so it's probably something they're pretty passionate about, especially if the church is entangled in the beast of politics which always leads to corruption of the institution in question. Can't happen to science? Ask Einstein about that-- the truth hits like a bomb. It was a mis-use of Adams. I was childish. Also I only wanted to refer to the advertising, stuff. Not so much the bottles. And sorry for taking something out on you, Packrat. I should have talked about what I really meant, and directed it at the artist/animator, rather than your opinion. However, I AM frustrated with certain other issues here I would rather not get into. I suspect that most Flayrah readers like beer, whether it is anthropomorphic or not. Personally, I'm not a fan; don't like the taste of alcohol, its expense, or its effect on people. I don't drink, smoke, or take any drugs unless directed by my doctor. Furry is my anti-drug! I drink knowledge mostly, or merely have glass when it's socially warranted merely to put those around me at ease. A tea-totter in a bar tends to make people a bit fidgety. Never been drunk, it's too much an inconvenience for someone who mostly relies on their own cognizance. If only beer is avaiable though, I'm not going to be able to finish the cup before I leave it. Mixed drinks I'd be able to finish though. Fur the'More's special mixed drinks I was able to finish, of course the bar guy there was quick to note they were a bit too sweet for his liking to one patron inquiring of them. TL:DR; "I don't normally drink alcohol; but when I do... I prefer pansy sweet drinks/wine coolers." -The most uninteresting roo in the world. I never liked beer either, though I did enjoy the occasional Margarita. I was a heavy drinker of soft drinks and fruit juices, until I became a diabetic. Today the nurses in my convalescent hospital yell at me if I drink anything stronger than ice water. Sigh. Strongest drug I've ever taken is Nyquil. Hey, when you weigh 110 lbs, that's some serious stuff! 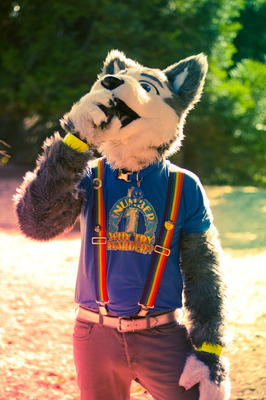 I wouldn't want to wear a fursuit that couldn't fit a beer bottle through the muzzle. I have to pick brands with long necks that fit. If you're trying to get me to smoke pot, if direct personal peer pressure couldn't do it, guy on Internet has his work cut out for him. "You should try pot; you would be so funny stoned!" "You mean I would be even more witty and clever than I already am?" "Oh, no, you would totally embarrass yourself, and it would be hilarious!" "You need to work on your salesmanship." Haha. Pot is bad for canines and felines though, I thought my chihuahua was dying last time she ate a flake of it off the floor some place. How about some Special K... or knowing this fandom... poppers and a dab of Frontline. If an artist uses it to create something I think that'd mean it effects creativity in a positive way, not intelligence. They are often confused. LOL, that's really debatable... Have you heard music made by potheads? Yeah, they're creative, didn't argue that point. You just made the same argument I was talking about. Of which my argument was not "Drugs are bad" it was "Intelligence is not equal to creativity". If the artist was smoking when they learned about the principals and rules of reading and writing of music then one can measure the impacted their intelligence. However, if they were in the process of making that music when they smoked, then one can only measure the influence it had on their creativity. So if I'm listening to their music, then I'm listening to what was made, not learned. Intelligence is the ability to acquire knowledge, creativity is the use of that knowledge in ways no one else can conceive of. Oh really? Haha, that's hilarious then, I came out with such a contrived argument for something that isn't even true in the first place. The one time I was ever high was an instance of overmedication on the aforementioned Nyquil (I think I may have my brands wrong; it was a cold/cough medicine, and I only realized later that, yes, you can get high that way). I then proceeded to perform standup comedy; it was terrible, though given the setting (it was actually a performed at an art gallery that featured an open mic for pretty much anything), I don't think anyone noticed, and would have been awfully polite anyway. Probably just relieved I wasn't another bad poet. Or, hell, maybe they thought my cough syrup induced ramblings were poetry. "... and this one time I was robotripping, I thought I was a fox!!" The animated beer labels were from some dude's blog, via a news site. I reposted it to Flayrah because I thought that most Flayrah readers would be interested in/amused by it. The advertising stuff is just to inform readers what Carmick's day job is, and where he gets the professionalism to animate beer labels.